← The 12-week scan – OMG it’s real! Mrs D will eventually agree, that Baby D will come home in this outfit on day 1. Clothes shopping has got to be one of my most hateful things to do (electronics on the other hand, bring it on). The idea of trudging around the shops and malls spending extortionate amounts of money on clothing fill me with a strange passive anxiety and I find myself routinely convalescing from open-wallet-surgery. £20 on a Tshirt is my limit, £40 on a pair of jeans and everything else is taken care of by Mrs D. who only has to hint that I look nice in something and I’ll have paid, bagged and driven home before I’ve realized what’s the hell has happened. Recently though, I’ve been so drawn to baby clothes. I love browsing through the adorable collections of clothes available for babies. They’re so freakin cute and the child in me seems to be able to identify with what the spawn of Dipz Danjal might like to wear! As I’ve said before, the onset of fatherhood is bringing with it, so many new experiences and perspectives. One of them being that shopping in Mothercare is actually quite therapeutic and makes me stop, think and give 100% of my time, energy and attention to dressing my future baby. On the other hand, I also see how much crap there is on the market that no parent in their right mind would ever need. The recent Baby Show I attended at Olympia in London was full of crazy inventions and contraptions (the nappy warmer was a personal favorite). Though my experience of the emotional con-trick is for another post…! For now, I’m happy to browse the shelves in the knowledge that I’m doing this all for our new little person. The want and indeed, need to give my baby my all is really growing on me. This makes NuDad, a content Dad. 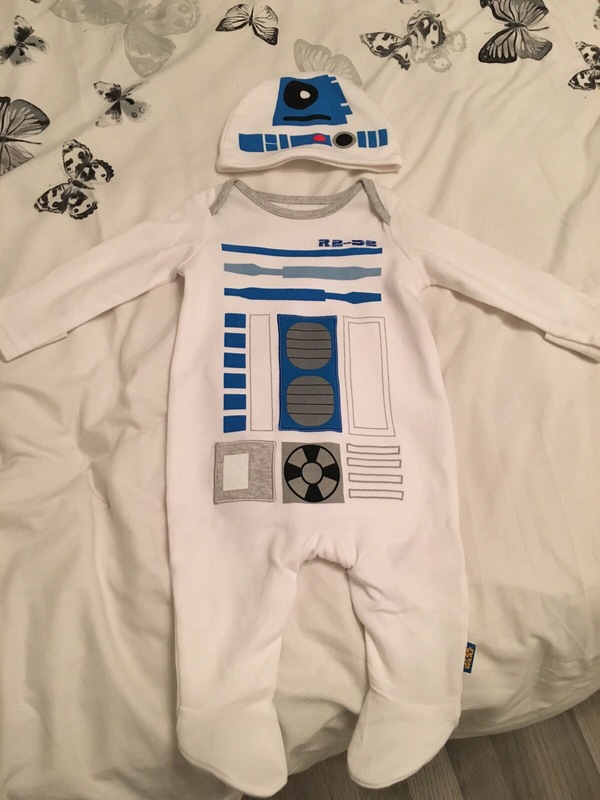 P.S – I’d have loved an R2D2 outfit when I was young… The indoctrination continues.